What type of Honey do YOU use? When I stumbled across Sheffield Honey to pick up a jar of their delights for my Thursday’s Brekkie Challenge: Honey Buttered Toast. I was very puzzled as to which type of Honey to have; Blossom, Heather or Soft Set? (I wasn’t sure what the three types really were)…..and asked for HELP! For those who are curious too. Take a read and become ‘abit of a’ Honey Connoisseur. Soft Set honey tends to be poly-floral being sourced from many types of flowers, allowed to crystalise (fine) and has a sweet honey flavour. Heather honey is a mono-floral honey crop sourced from the heather moors in August, its taste is smooth and rich, and is highly aromatic! Blossom honey is also poly-floral but is an early seasons honey, its runny and mild and great on cereal, toast and perfect for cooking. 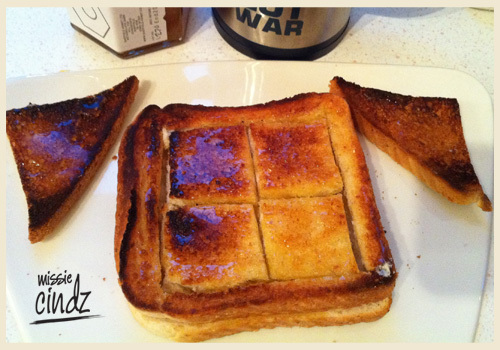 If anyone fancies trying out my Missie Cindz: Sheffield Honey Buttered Toast recipe, here’s the full recipe to download for your keeps – let me know what you think!